Successfully Added Portable Pocket Sized 120GB SATA Hard Drive to your Shopping Cart. 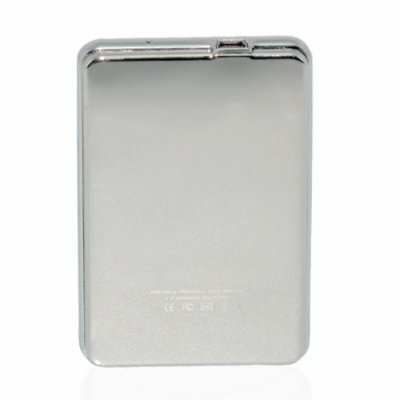 Portable 120GB SATA external hard drive with a transfer rate of 480 Mbps via USB 2.0. Pocket sized external HDD for easy transfer and file storage. We all know how some laptop accessories can be bulky and heavy to carry around in your laptop bag! Well, here we have found the perfect solution for you! This amazingly profiled and slim SATA 120GB hard disk comes in a very durable polished aluminum casing which is both durable and stylish. The SATA 120GB hard drive can be used as a portable storage HDD or simple external drive for simple storage and allows for quick file transfer using high speed USB 2.0. This is a very useful item for both business travelers and college students and makes a great unit to store your digital media or large presentation files. Ultra portable 120GB SATA HDD. Provided with a slick looking designer bag. Use the SATA 120GB hard disk to transfer or backup your files, with only one simple USB connection to your Laptop, this allows for a more practical usage. The collective aspects such as performance, design, durability, casing and quick file transfer, all being attended to perfection with the user in mind, positions this SATA 120GB hard drive as a top seller. Get the CVSBK-6300-120GB today as gift or for your own personal use to back-up all your videos and wonderful memories so that they will last forever.